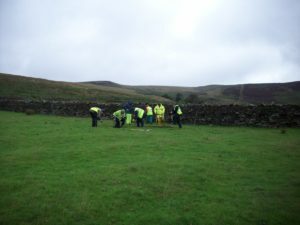 A return to Calf Hill in the rain was arranged as a result of questions raised by the magnetometry survey completed by Mike Woods on 13/8/2018. Test Pit 1 was opened between the banks to ascertain if the cobbled surface found in Trench 2/3 continues between the banks. 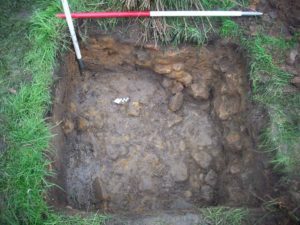 Test Pit 1 (1m2) was opened to the west of a (now fallen) large stone which may have been a path marker. 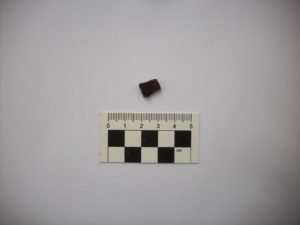 A similar cobbled surface to that found in Trench 2 was found at a depth of 50cm. The eastern side of the test pit suggested that the path crossing the bank feature had been reinforced with stones, perhaps to reduce the amount of mud in this area. 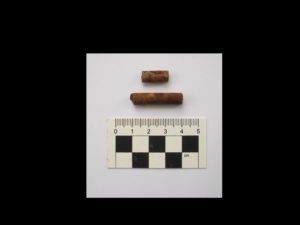 The last layer of these was at a depth of 11cm below the turf. This feature seems to be on top of, and therefore later than, the cobbled surface. Finds in the test pit were mainly pieces of chert. Trench 4 (2mx4m) was opened over the possible road feature identified in the magnetometry survey. The turf and top soil were relatively easy to remove in the north-west section of the trench. The turf and top soil were harder to remove in the south-east section of the trench. 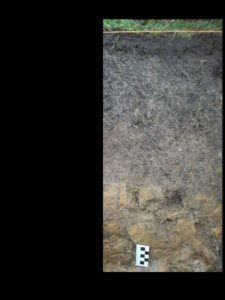 A sondage in the south-east of the trench showed a layer of pink clay with 5% stone inclusions (Context 4) 20cm below the level of the turf. Further investigation revealed a layer of orange clay with 5% stone inclusions (Context 5) 35cm below the level of the turf. This layer continued with alternating wet and dry clay. Flecks of charcoal could be seen in Context 5, suggesting that the layers could be manmade. A darker area in the south-west side of the sondage was also identified, perhaps containing charcoal. Calf Hill – Day 9. Result!